While popping pimples may seem like a good way to speed up the healing process, you should resist the urge. According to the Centers for Disease Control and Prevention, popping pimples increases the risk of scarring. If you suffer from acne or occasional blemishes, try to keep your hands away from your face, as the oils and dirt from your hands can make breakouts worse. In addition to scarring, popping pimples may result in skin irritation, bleeding and infection. Popping and squeezing only aggravates pimples. In fact, any improvement will be temporary, reports Georgetown University Health Education Services. Soon after popping, a pimple will reappear, often with increased redness or irritation. Even if you pop a pimple and it looks less obvious, the irritated and inflamed pore leaves a mark that remains longer than the pimple itself would have stuck around. Popping, picking or scratching the surface of a pimple can cause it to bleed. When a pimple bleeds, the clogged pore beneath is exposed, leaving it susceptible to bacteria on the skin. As white blood cells combat these invading bacteria, the clogged pore will become inflamed. With the appearance of swelling and dried blood, a popped pimple may be even more noticeable than before. According to KidsHealth, an online resource of the Nemours Foundation, popping a pimple forces bacteria deeper into the skin. This influx of bacteria can cause infection of the clogged pore, making the area surrounding the pimple more reddened and inflamed. Instead of popping a pimple, apply benzoyl peroxide gel to dry it out and prevent further infection. Popping pimples can lead to scarring, warns the Centers for Disease Control and Prevention. Injuring the tissue surrounding a clogged pore may damage it permanently and leave a scar. This is especially true of troublesome acne lesions, such as papules, pustules, nodules and cysts -- all of which can be very painful. 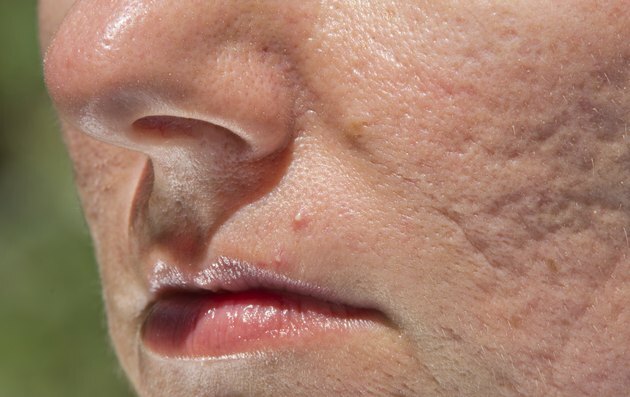 To avoid scarring and lasting skin damage from pimples, do not pop or squeeze them. Be careful when shaving to avoid nicking pimples, because doing so can also result in scarring.